Obama Gets In Touch With His Irish Roots The president was warmly welcomed in Dublin and in Moneygall, a village that was once home to his great-great-great grandfather. 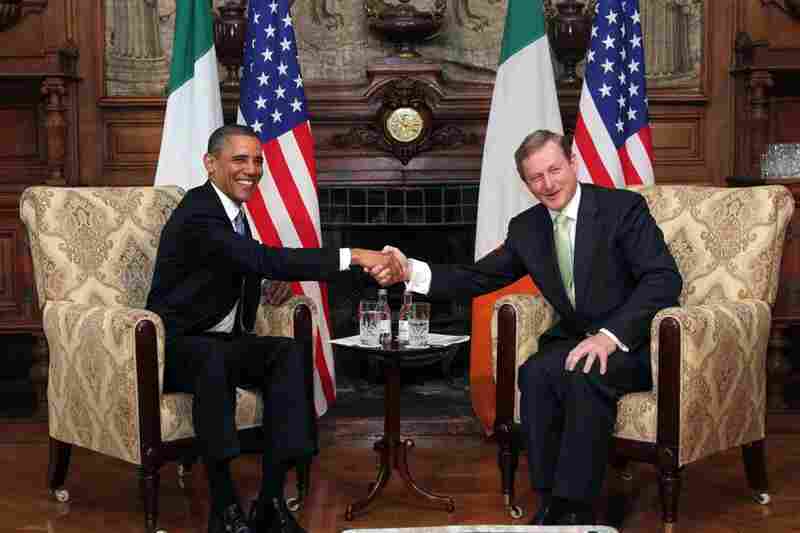 Obama and Irish Prime Minister Enda Kenny emphasized unity and cooperation between the nations. "We are bound by history and friendship and shared values," Obama said. President Obama and first lady Michelle Obama sample a glass of Guinness on Monday in Moneygall, Ireland. 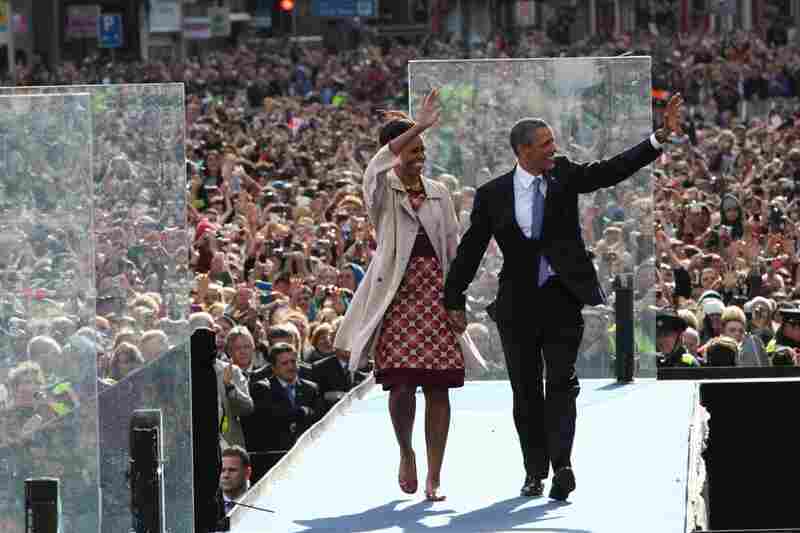 President Obama and first lady Michelle Obama at a rally on College Green in Dublin. The Obamas are visiting Ireland for one day. 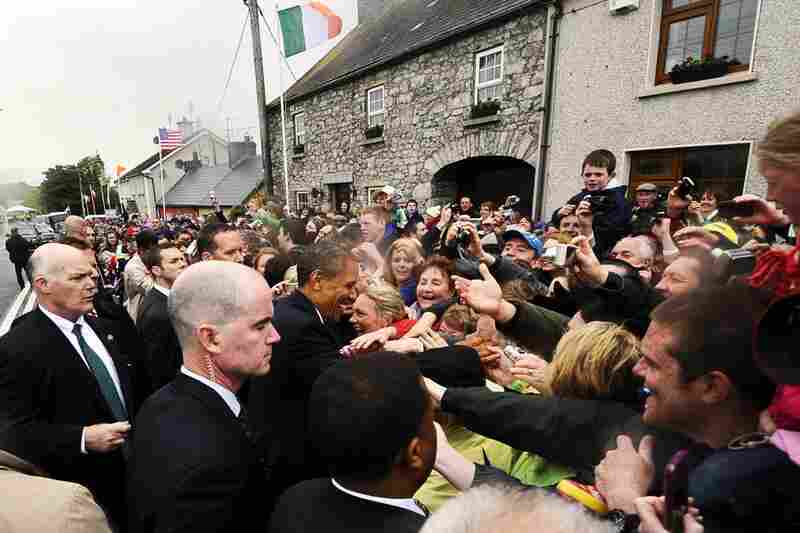 Obama greets residents in Moneygall, the village of his great-great-great grandfather Falmouth Kearney. 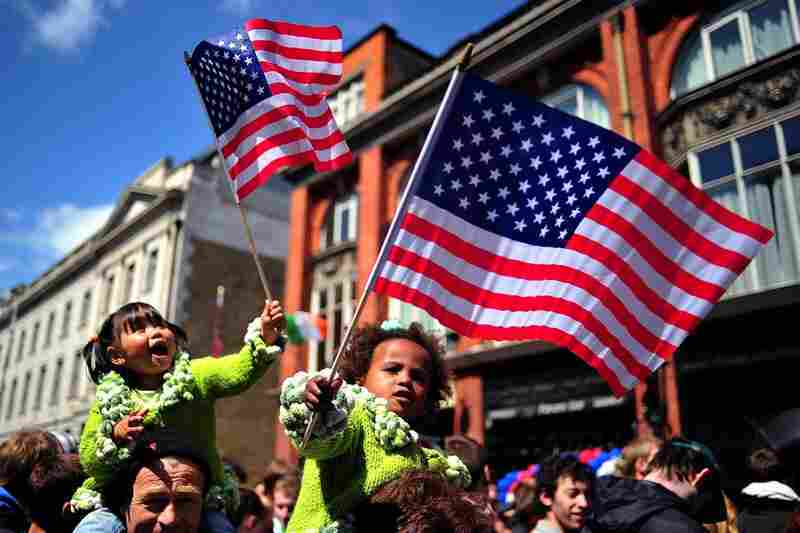 Children wave U.S. flags as they wait to see Obama address a rally at College Green in Dublin. 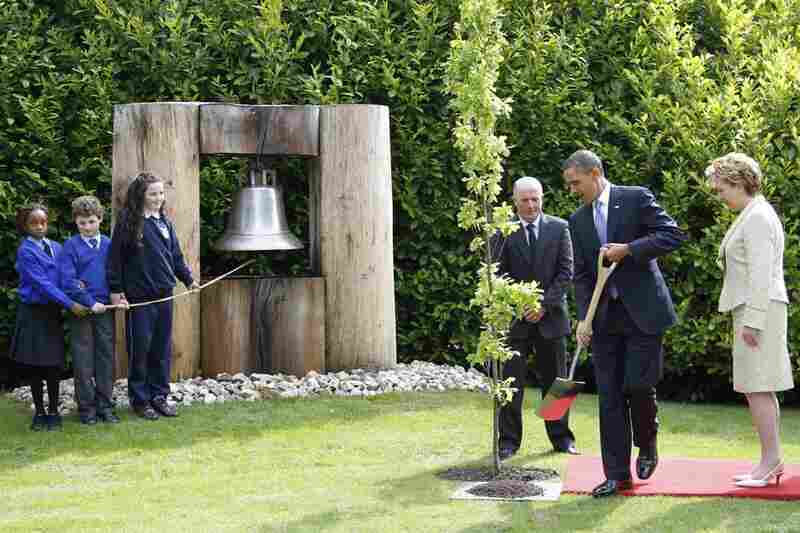 Obama plants a tree at the Peace Bell with Ireland's President Mary McAleese. 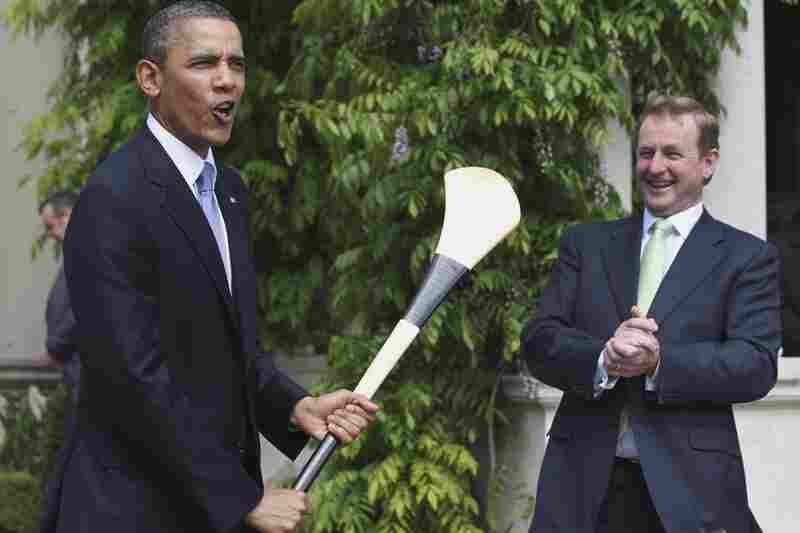 Irish Prime Minister Enda Kenny presents Obama with a hurley stick — used in the Irish national sport of hurling — while at Farmleigh, Dublin. 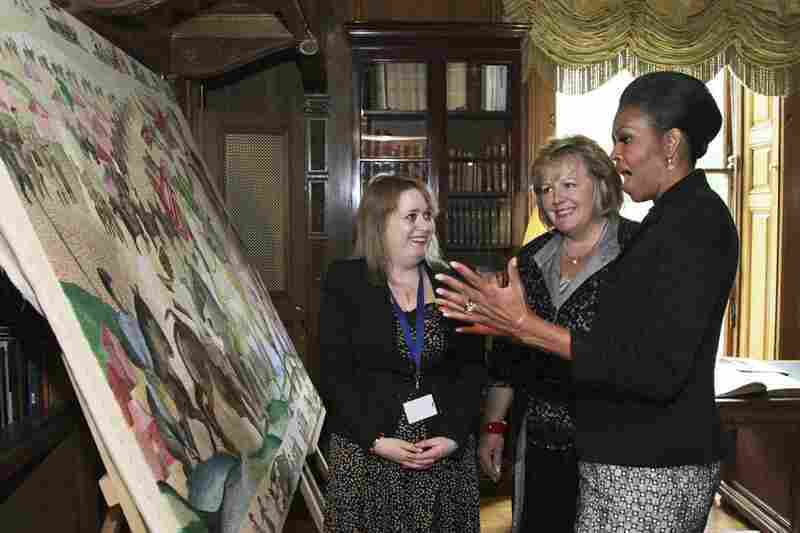 First lady Michelle Obama and Fionnuala Kenny (center), the wife of Irish Prime Minister Enda, view an embroidered panel depicting the Norman Invasion, during a tour of Farmleigh House in Dublin. Obama and Prime Minister Enda Kenny shake hands during talks at Farmleigh. President Obama told a boisterous crowd in Ireland on Monday that both their country and the United States will recover from tough economic times, just as they have in the past. Ireland was the first stop for Obama on a six-day European tour. He stressed the strong ties between the two countries — fostered in part by millions of Americans with Irish ancestry — and also paid tribute to his own Irish forebears by visiting the village his great-great-great-grandfather came from. For a guy who once had trouble talking his way into Chicago's St. Patrick's Day parade, Obama was certainly welcomed to Ireland like a favorite son. An estimated 25,000 people braved off-and-on rain to fill the College Green in Dublin on Monday evening for his outdoor speech. The president introduced himself, even though the crowd was already chanting his name. "My name is Barack Obama, of the Moneygall Obamas, and I've come home to find the apostrophe we lost somewhere along the way," he said. Moneygall is the tiny town in County Offaly that gave birth to the president's Irish ancestor, Falmouth Kearney, the grandfather of his maternal grandfather. Obama paid a visit to Moneygall on Monday, and even though the population of the village is fewer than 300, it seemed as if 10 times that many people were lining the main street to greet him. Every house in Moneygall was freshly painted for the president's visit. Kelvin Young, 15, adopted a more personal decoration — he colored his braces red, white and blue, and it got Obama's attention. "He just started shaking hands everywhere," Young said. "So I put me hand out and he came and shook my hand and hugged me. Forgot me ticket, though, so I couldn't get his autograph." Moneygall residents like Alice Bergin have been looking forward to this visit ever since St. Patrick's Day, when Obama announced the trip. "We thought this day would never happen, so it's great," she said. "I suppose before this, it was almost like we'd gone off the map. We had a new motorway and no traffic came through the village. So it's wonderful. We're back on the map and people come and visit. So hopefully it will last for a while anyway." The president shook hands from one end of town to the other, stopping briefly in Ollie Hayes' local pub for the obligatory pint of Guinness. 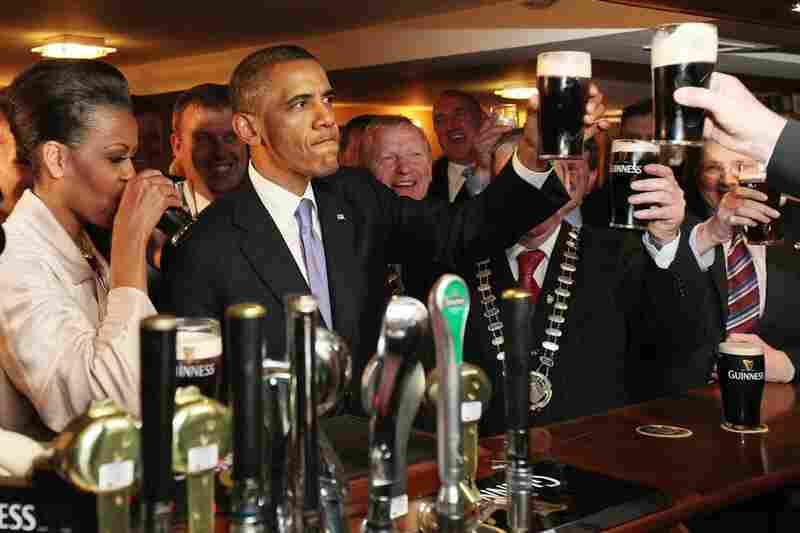 Obama said he felt warmed by the Irish hospitality and warmer still after the beer. And he described the successful peace process in Northern Ireland as an inspiration to the world. Earlier Monday, Obama helped plant a tree in Dublin's Phoenix Park, alongside one planted by Queen Elizabeth just last week. The trees stand next to the Peace Bell, which commemorates the Good Friday Agreement. The president's visit has been a lift for Ireland as it struggles to emerge from a deep recession and wrenching austerity measures. Prime Minister Enda Kenny took the opportunity to boost tourism by extending an invitation to tens of millions of Irish-Americans. "Whether you're listening and watching in New York or New Haven or San Diego or St. Louis, we, your Irish family, are right here to welcome you to follow your president home," Kenny said. Kenny said the offer is good for anyone who is Irish by blood, marriage or simply desire. Obama picked up on that point, saying you don't have to have Irish ancestry to appreciate the strong connection between the tiny island and the U.S.
"We are bound by history and friendship and shared values," Obama said. "Shared values" will be a common theme for the president as he travels to Britain, France and Poland this week to discuss the important role Europe must continue to play around the world. The president is leaving Ireland ahead of schedule Monday to avoid being grounded by a volcanic ash cloud. But he's leaving behind many sunny memories.